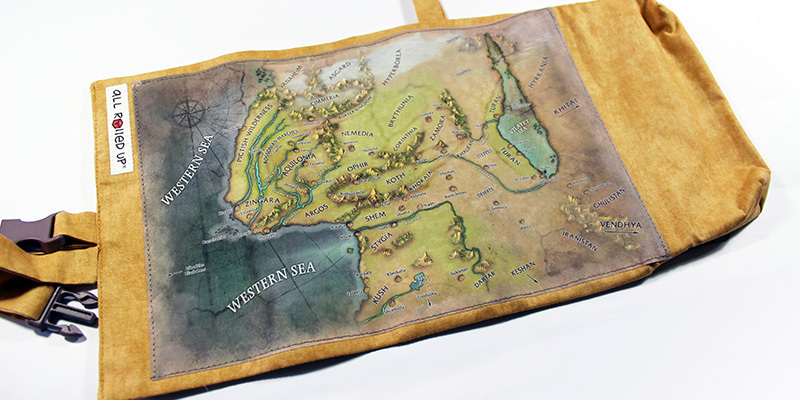 We have a wide, and expanding, range of designs for our roll-up game organizers and folding dice trays, but we’re always open to the challenge of a new commission piece. When we get a new commission, we always work hard to come up with a design that both meets expectations while remaining practical. We have worked hard on the current design of the All Rolled Up and it all fits together as it does to ensure you receive a functional, sturdy and hardy product. As we have seen at many conventions, when people show us their first generation products, an All Rolled Up should last you for years of very active use. Age of the Cimmerian celebrates the interests of a gamer, the world of Robert E. Howard’s Conan, and our enthusiasm for tinkering with the All Rolled Up design. We provide design consultancy as part of the commission process and work hard to find the best fabric and design to suit specific needs. 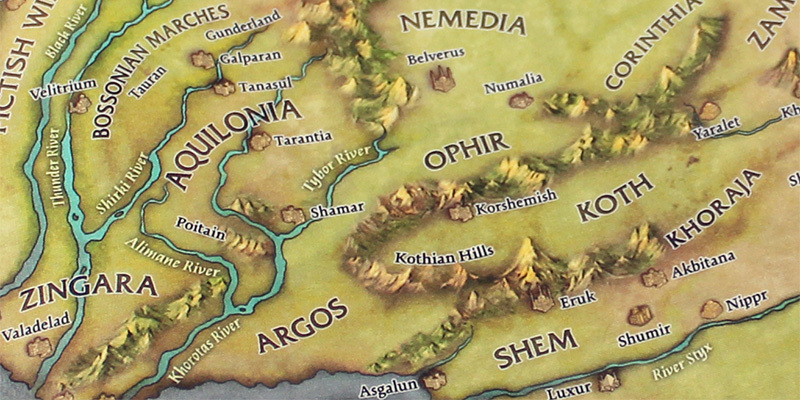 This design uses a map panel from Modiphius Entertainments new 2d20 Robert E. Howard’s Conan roleplaying game, used with kind permission. We always consider requests for use of artwork from games and favourite artists, but we ask that you seek written permission before you get too attached to the idea of a commission! When we work on a commission, we create the panel art ourselves – with great care and attention to the detail. You can see from the close up that a high definition image makes all the difference. The design of Age of the Cimmerian accommodates the specific needs of the commission, replacing the standard pen organiser with an additional pocket and expanding the central pocket to the size would normally refer to as a ‘book pocket’. 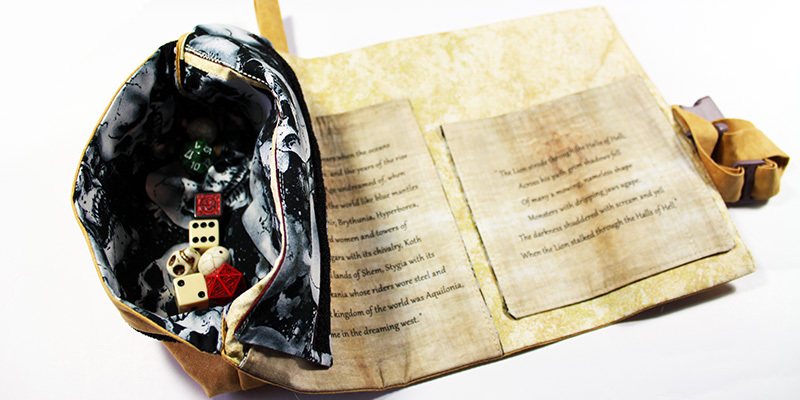 The pockets have printed exterior designs, again to the specifications of the commission, feature Conan-related quotes. In addition to the change in design, we also adopted a slight change to the construction of the pockets. A standard All Rolled Up has a common fabric used for the inner pockets and the dice pocket interior. However, for this commission, we used a completely different type of fabric – one emblazoned with skulls – to line the inside of all the pockets. Overall, we think the final product looks pretty incredible – and we’ve had very positive feedback on the commission. Thanks again to Modiphius Entertainment for their kind permission. 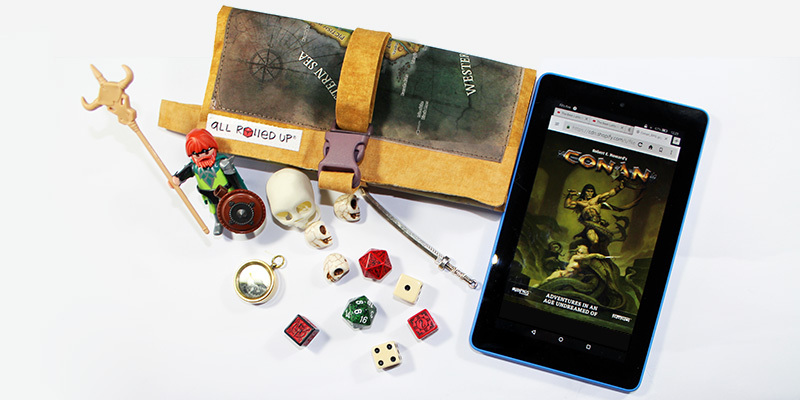 Is there any chance you could make this Conan custom product available to the rest of us? I’m pretty sure that a lot of Modiphius Conan Rpg pledgers would, like me, love to get their hands on this.